The conversation was, of necessity, lively and smart: fashion, cinema, love affairs, politics, and, yes, the possibility of war—that too had its moment. Almost anything, really, except money. Or, rather, German money. A curious silence, for hundreds of millions of francs—tens of millions of dollars—had been paid to some of the most distinguished citizens of France since Hitler’s ascent to power in 1933. But maybe not so curious, because those who had taken the money were aware of a certain shadow in these transactions and, in that shadow, the people who require darkness for the kind of work they do. It doesn’t take Stahl long to become perplexed and disturbed by the political situation in France and uneasy about seeing his former boss from his days working at the Austro-Hungarian Legation in Barcelona. Gradually, he begins to understand why his friends were cautious in their congratulations when he told them about the job in Paris. An offer to judge a film festival in Germany and an interview that goes awry adds to his worries. Soon, he’s immersed in a world of secrets and espionage. Will he get out alive? 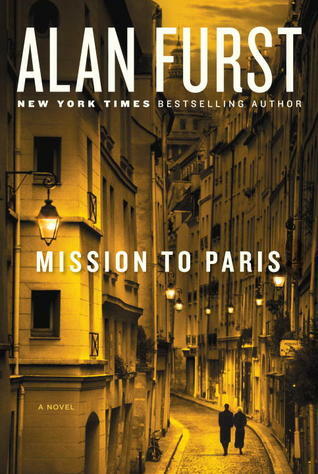 Mission to Paris is the second of Alan Furst’s novels that I’ve read. The first, The World at Night, is set in France during the German occupation and also features a man from the film world who is drawn into the world of spying. I enjoyed The World at Night, but I liked this book even more. The way the Germans quietly insinuated themselves into France, long before they officially invaded, shows what money and media can do to alter history. Even the word peace has sinister implications in this world, as Stahl finds when in a interview his expressed desire for peace is taken to mean he supports rapprochement with Germany. Stahl as a character is well drawn and easy to get behind, despite his womanizing ways. He’s honorable, charismatic, only a little naïve about politics, and good at his job. He can’t throw a punch like Charles Gable or fight a duel like Errol Flynn, and he’s not “so sophisticated” as Charles Boyer. “Mostly he played a warm man in a cold world.” (I pictured a Continental Ronald Colman.) His eventual love interest is a smart and passionate woman who knows what’s what. The romance moves a little quickly, even under these circumstances where time must move quickly, but I found this affair easier to believe in than the one in The World at Night. In both books, I was struck by Furst’s ability to create atmosphere. This book in particular felt like a 1930s film. The characters, the settings, the clothes all seemed like things I’d seen before, not because Furst relies entirely on types and clichés but because he builds on those familiar cultural references to create something new and entertaining. All of the actors were made up, but I could see them, and I could easily picture the scenes from Après la Guerre, the film Stahl is working on. Goodreads lists this book as #12 in Furst’s Night Soldiers series, but from what I can tell, this isn’t a chronological series that has to be read in order. The books have some overlapping characters, and I believe they all involve World War II Europe. I’ve read the 4th and 12th books with no ill effects, so don’t let a fear of missing something from an older book hold you back if this one sounds good. It doesn’t rely on the earlier books at all. I think anyone interested in 1930s film, spy fiction, or fiction about World War II would find something to enjoy in Mission to Paris. This is a name I’ve seen on the library shelves, but not picked up. However, if the writing is as good as you suggest then perhaps the time has come to change that, especially if they don’t have to be read in order. Getting backlist material from our library system is becoming increasingly difficult. I thought the writing was excellent, so evocative! I read Furst’s Dark Voyage some time back and enjoyed it. Somehow his name kind of dropped off my radar. Thanks for the reminder! I’ll keep Dark Voyage in mind when I want to read more Furst. He’s so prolific that it’s helpful to know what others have liked. I enjoyed The Spies of Warsaw, so I’m definitely going to have to read this one. Great review! Spies of Warsaw is one I’ve heard several people praise, and I’ve heard there’s a miniseries with David Tennant coming! I was wondering which book you had read after I saw your comment on my post. This one, happily, is waiting for me at the library as I requested it ages ago. I seem to be inundated with books at the moment (though when am I not? ), but I am going to try hard and squeeze it in as I am sure this would be something I enjoy. And I know what you mean by an author using cliches character-wise, but they still work in a good story–that familiarity has something going for it! Thanks for the heads up as now I will bump this one to the top of my pile! I really think this would be up your alley, so I’m glad to hear you were at the top of the library’s list already! I think the line between a lazy cliche and a comfortingly familiar type can be pretty fine in fiction. Furst stays on the right side of the line here. Furst has long been on my TBR — I hadn’t realized this was part of a series — I’m up to review this so we’ll see if I notice a problem. You’ve got me excited though — I love mood and ambiance! I hope you enjoy it as much as I did! I really think the series idea merely has to do with the fact that they’re set in the same era. They aren’t even in chronological order. I enjoyed Spies of Warsaw too, so this one is definitely going to be read one day soon. I hadn’t realised he’d written a series too. I guess everyone knows everyone in the spying game! I think Spies of Warsaw is actually considered part of the series. From what I can tell all but a few of his books are part of it. Thank you for your informative post. It is always nice to find a series that one may choose a single book and read it as a stand alone. I have not read any of this series, so I will have to give one a try. A series of stand-alone books is probably the right way to think of these. I wouldn’t even have mentioned that this was part of a series if I hadn’t been worried that people would look it up and think they needed to read the others first.